Work on the Subansiri Lower Hydroelectric Project in Assam has stopped due to protests by NGOs and student groups. 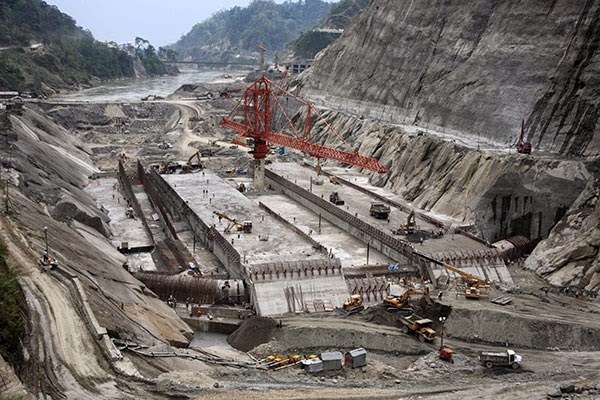 Gerukamukh (Assam) Jun 17 : Along with the National Hydroelectric Power Corporation (NHPC), Delhi is probably the biggest loser due to the anti-dam protests at the Subansiri Lower Hydroelectric Project (SLP) straddling Arunachal Pradesh and Assam. Delhi was supposed to be the biggest buyer of the power that was to be generated from the dam which could have ended have ended its power problems had it been commissioned in March. Instead, now the NHPC is losing Rs. 10 crore every day due to the protests. The loss on the 2000MW SLP crossed the Rs900-crore mark on Monday when PM Narendra Modi laid the foundation of the India-funded 600MW Kholongchu hydel project in Bhutan, some 500 km to the west of the project. The Delhi government had signed an agreement with the NHPC for buying power from SLP before the project had even received clearance for work to commence from January 2005. The eight-unit project was scheduled to start generation from mid-March but Assam-based pressure groups labelled the SLP an invitation to disaster and forced suspension of work in December 2011. By that time, the NHPC had put more than 60% of the infrastructure in place. “Had we started generation, Arunachal Pradesh and Assam would have received 240MW and 25MW free power as per the Gadgil formula. Our project could have ended Delhi’s power woes after selling it an agreed-upon 508MW of electricity,” SLP executive director Rakesh told HT. But with the SLP having run into rough weather, the NHPC is not sure when it can start generation after completing the 116m high — revised from the original 257m — dam and powerhouse. Though there are several higher dams in India, SLP is the largest generation-wise.“We expected to start selling power from March. Instead we are losing revenue at Rs. 6.59 crore a day. Loss due to idling of men and machinery makes the figure Rs. 10 crore. This is besides the cost escalation of almost double the Rs. 7300 crore we invested,” Rakesh said. Hoping the new government would help resume work on SLP soon, particularly in the wake of the Intelligence Bureau report on foreign-funded NGOs stalling development projects in India, NHPC officials said the project was modified on the recommendations of an expert committee.But local NGOs and student organisations have refused to accept the changes, saying they were not enough to safeguard the life and property of villagers downstream. There is no opposition to the project in Arunachal Pradesh, whose government too wants the SLP to start soon.